212 Commonwealth is located on the south side of Commonwealth, between Exeter and Fairfield, with 208 Commonwealth to the east and 214 Commonwealth to the west. 212 Commonwealth was designed by Peabody and Stearns, architects, and built in 1879-1880 by Vinal & Dodge, masons, and Andrew Anderson, carpenter, as the home of wholesale grocer Benjamin Warren Munroe and his wife, Ellen Hedge (Lunt) Munroe. He is shown as the owner on the original building permit application, dated November 28, 1879. 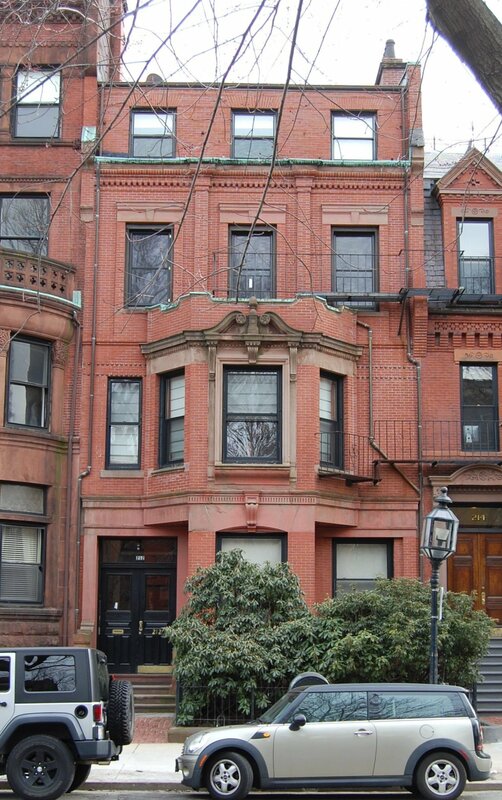 212 Commonwealth was built on a lot 26 feet wide on land that originally was sold by the Commonwealth of Massachusetts at public auction in October of 1879. Benjamin Munroe either was the successful bidder or acquired the right to purchase the land from the successful bidder. He held that right by January 24, 1880, when he entered into an agreement with George Quincy, owner of the house at 214 Commonwealth, to purchase a six inch strip of land with the eastern half of the party wall on it. Construction of 212 Commonwealth started soon thereafter. However, Benjamin Munroe did not complete his purchase of the land until well after the house was completed. On June 2, 1885, he purchased a 26 foot wide lot from the Commonwealth. On June 4, 1885, he sold a six inch strip to the east, with the eastern half of the party wall on it, to Henry C. Jackson, who subsequently built his home at 208 Commonwealth. And on June 18, 1885, he purchased the six inch strip to the west (with half of the party wall with 214 Commonwealth on it) from George Quincy, consistent with the agreement five years earlier. 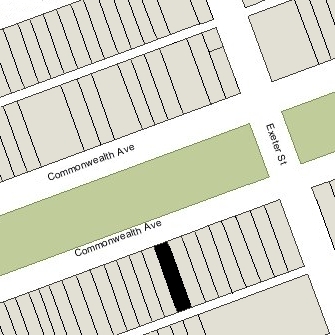 The net width of the lot at 212 Commonwealth remained 26 feet. However, when the deed was conveyed by Benjamin Munroe’s heirs in 1901, the acquisition of the six inch strip to the west was not included and the frontage was indicated as 25 feet 6 inches. Subsequent deeds reflect this dimension. Click here for an index to the deeds for 212 Commonwealth. By the 1880-1881 winter season, Benjamin and Ellen Munroe had made 212 Commonwealth their home. They previously had lived in Dorchester. 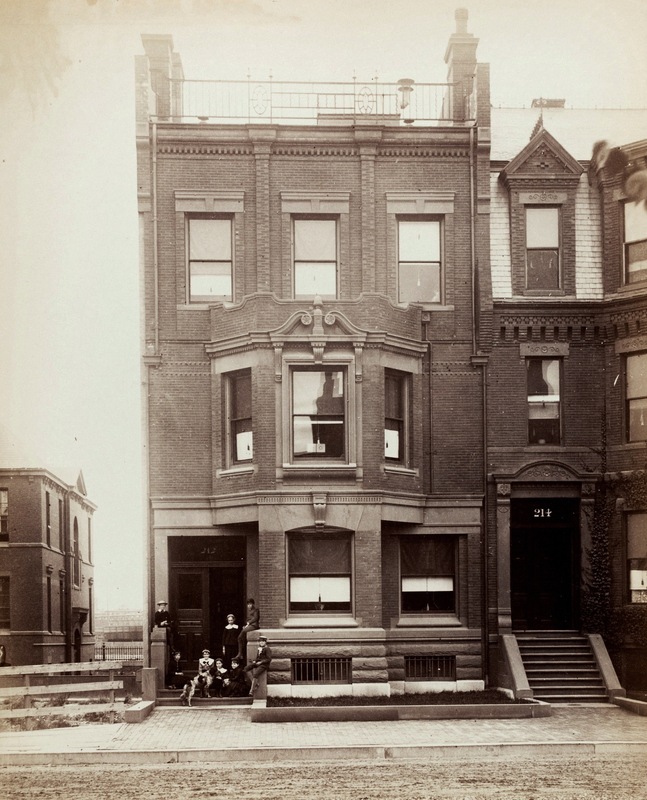 They continued to live at 212 Commonwealth during the 1899-1901 season, but moved thereafter to 31 Newbury, where they were living at the time of his death in March of 1901. 212 Commonwealth was not listed in the 1901 Blue Book. On October 11, 1901, 212 Commonwealth was sold by Benjamin Munroe’s heirs to George Alonzo Gibson. The sale was subject to a lease expiring August 1, 1902. During the 1901-1902 winter season, it was the home of Herbert Merriam and his wife, Fanny (Hawes) Merriam. Herbert Merriam owned and operated Cherry Brook Farm in Weston, which was their primary residence. By the 1902-1903 George Gibson and his wife, Emily Ruth (Dickinson) Gibson, had made 212 Commonwealth their home. They previously had lived in Medford. They also maintained a home in Marblehead. Formerly a lawyer, since 1881 George Gibson had been a piano manufacturer, a founder and president of the Ivers & Pond Piano Company. The Gibsons’ son, Kirkland Hopkins Gibson, lived with them. After graduating from Harvard in 1904, he joined his father’s piano manufacturing firm. He married in April of 1905 to Florence Warner. After their marriage, they lived in Brookline. George Gibson died in May of 1921. Emily Gibson continued to live at 212 Commonwealth until her death in 1925. Kirkland Gibson had died in December of 1921 and 212 Commonwealth continued to be owned by Emily Gibson’s estate, in trust for the benefit of Florence (Warner) Gibson, who continued to live in Brookline. By 1928, 212 Commonwealth had been converted into a lodging house, known as the Fellowship House. In April of 1929, the Building Department issued a notice of violation to the Boston Safe Deposit and Trust Company, as agent for Emily Gibson’s estate, for failure to provide adequate egress. 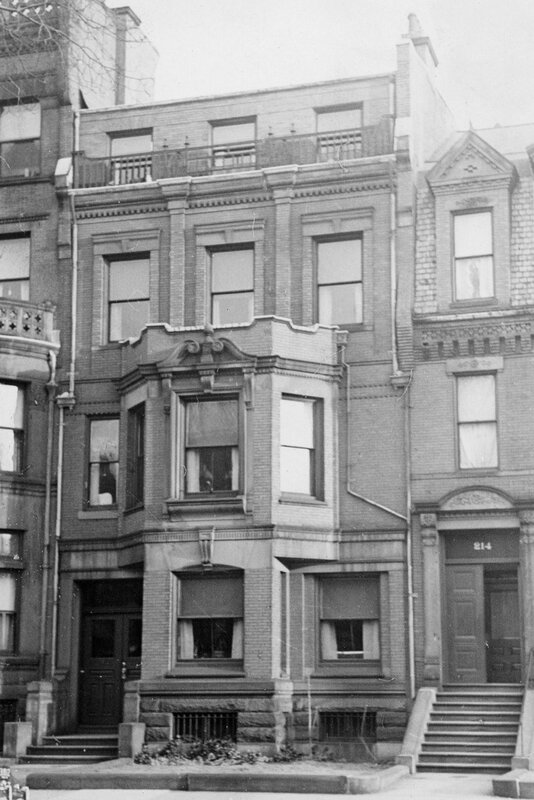 In October of 1930, Boston Safe Deposit and Trust filed for (and subsequently received) permission to convert the property from a single-family dwelling into a lodging house, including installing the necessary fire escapes. By 1931, 212 Commonwealth was the home of Mary Agnes (called Agnes) (Witter) Lindsey Hobart, widow of John Sumner Lindsey and of Edward Ellis Hobart, and her niece, Miss Alice Manning Wright (daughter of Edward Gilmore Wright and Eliza Lyon (Witter) Wright). They had lived at 302 Commonwealth in 1930. Prior to Edward Hobart’s death in January of 1928, they had lived in Plymouth, where he was Clerk of the County Court and she was principal of the Plymouth High School. Agnes Hobart operated a lodging house at 212 Commonwealth. She died in March of 1936. Alice Wright continued to live there (and maintain a lodging house) until about 1946. On April 29, 1946, 212 Commonwealth was acquired from Florence Gibson by Ray F. Mitchell, a salesman. He and his wife, Dorothy A. Mitchell, made it their home and operated it as a lodging house. They previously had lived at 46 Pinckney. They continued to live at 212 Commonwealth until about 1952. On March 4, 1952, 212 Commonwealth was acquired from Ray Mitchell by James Cambourelis, and on May 16, 1952, it was acquired from him by Gaetano La Marca, founder of the Prince Macaroni Company. He and his wife, Francesca (Seminara) La Marca lived in Winchester. In June of 1952, he filed for (and subsequently received) permission to convert the property from a lodging house into three apartments and two medical offices. On February 9, 1953, Gaetano La Marca transferred the property to the La Marca Realty Corporation (his wife, Francesca LaMarca, was the president). He died in March of 1955. On December 1, 1958, 212 Commonwealth was acquired from La Marca Realty by John Jacques Beaubien. He lived at 197 Marlborough, an apartment house he owned with James Sutherland Ambrose. By 1961, John Beaubien and James Ambrose had moved to one of the apartments at 212 Commonwealth. On August 29, 1961, 212 Commonwealth was acquired from John Beaubien by Kenneth L. Shaw. On December 30, 1964, 212 Commonwealth was purchased from Kenneth Shaw by Alfred J. Greenwood, a mechanical engineer. He lived in one of the apartments. The property changed hands and on February 28, 1974, was acquired by Stephen E. Mermelstein. By the mid-1990s, the property had been converted into eight apartments. In April of 1996, Stephen Mermelstein filed for (and subsequently received) permission to correct several fire safety violations and to change the legal occupancy from three apartments and two medical offices to seven apartments. In June of 1999, he filed for (and subsequently received) permission to divide the apartments on the top floor and increase the number of units from seven to eight. On July 2, 2015, Stephen Mermelstein transferred the property to the Nalu Realty LLC. At the time of the transfer, he lived in Wailuku, Hawaii, and the Nalu Realty LLC was located there as well. On September 7, 2017, 212 Commonwealth was purchased from Nalu Realty by the 212 Commonwealth Avenue LLC (John E. O’Donnell, manager of record). In November of 2018, it received permission to remodel the building, converting it from eight units to two units and adding a penthouse and one-story rear addition.